Prologue: Upon it’s formal handing back by the British in 1997, the Chinese government agreed to permit Hong Kong a “high degree of autonomy” for the following 50 years under the framework of “one country, two systems.” However, in recent years Hong Kongers have become increasingly concerned that Beijing is actively attempting to dismantle this system. Sparked by Beijing’s recent announcement that it would decide on the candidates for the 2017 chief executive election, the past two nights have seen mass, peaceful, pro-democracy demonstrations across the city. Led largely by students, the organisers of the Occupy Central movement and traditional pro-democracy groups, Hong Kongers have so far defied the demands of authorities to disperse. Indeed, the use of tear gas, pepper spray and batons by police has only brought more people onto the streets. As China’s National Day, October 1, quickly approaches, it seems that the “umbrella revolution” is just beginning. For a comprehensive timeline of Hong Kongers’ campaign for democracy and universal suffrage, please Click Here – Brett Elmer, Publishing Editor. September 28, 2014. The day I began to feel what it was like to live in fear. I have not been brave enough. Most of my friends have taken to the street in the past few days. Instead, I have stayed at home and bombarded AP, Reuters, Guardian, the BBC, the Times of London, and numerous other international media outlets with tweets and photos. The world needed to see the brutality that was being inflicted on unarmed citizens who merely wanted a sensible dialogue with the government. We want a Chief Executive with Hong Kong interests in mind. We want better policies for the people. We want to end the prospect of an increasingly corrupt government. We want to vote in a person who can make this happen. The night before the calamity of tear gas and military-grade pepper spray, my friend and I were talking about the prospect of change. We were at his place; a place with a sweeping view of prosperity. Looking out to the Central skyscrapers, he pointed at the crowd down below on Tim Mei Avenue. “Look at those sillies!” he said. “What do you mean?” I asked. “What do they think they can change? They can’t change a thing. That is their political reality. Hong Kong is part of China,” he mused. The day after, on September 28, I awoke to a barrage of Whatsapp messages. “I am in Admiralty now; bring face masks, cling film, and goggles.” “I am in Central, who is around?” My friends have flocked to the central business district of Hong Kong to support the student movement organised by Scholarism and the Hong Kong Federation of Students. They have been leading a citywide class boycott in a bid to demand dialogue with the government. On the night of the 26th, the leader of Scholarism, 17-year-old bespectacled Joshua Wong, climbed over a high fence at Government Headquarters at Tamar to reclaim his civil rights to freely enter the public space in front of Gov HQ, a place called the Civic Square, which was by now a caged-in prison barred by three metre high metal poles. Wong, along with his colleagues Alex Chow and Lester Shum, were arrested. Many in Hong Kong condemned the arrest of the three student activists. Since then, support has grown in their thousands in front of Gov HQ, unanimously demanding the release of these three students. But that would not take place for another 40 hours, until the High Court issued a Habeas corpus which compelled their immediate release from custody. As I watched the day unfold, my pride as a Hong Konger rose. 80,000 protesters on the streets, not one car overturned, not one shop looted, not one tyre burnt. The protesters organised impromptu recycling stations, formed an orderly line to let traffic through, volunteered at first aid stations, donated supplies such as masks, bananas, bottles of water, cling film, and towels. Yet, it was these people, who had already raised their hands in the air and turned their back at the police – provocation none-intended – who were shelled with 87 rounds of tear gas. 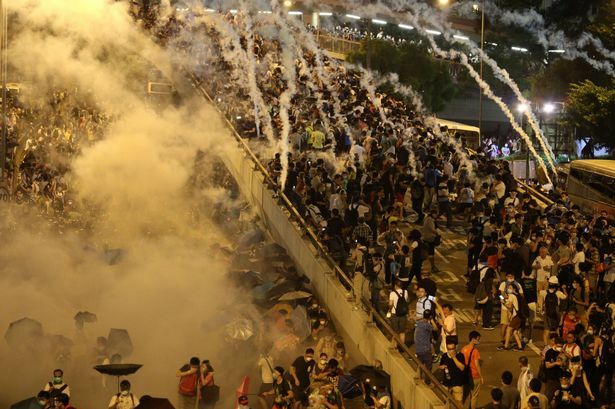 Eighty-Seven rounds of agony-inducing tear gas were aimed at unarmed citizens – some even targeted first aid stations. When the first tear gas was deployed, photos emerged of the riot police holding a sign which read: “DISPERSE OR WE WILL FIRE”. Suddenly, deaths seemed possible. Frantically I tweeted: “DEAR HONG KONG POLICE, PLEASE SHOW RESTRAINT. YOUR SONS AND DAUGHTERS WILL ONE DAY ASK WHAT YOU DID TODAY. AND YOU WILL TELL THEM I KILLED A MAN.” I was wired for the whole day. I would not go to bed for the next 20 hours. I was praying that the day would end blood-free. As the night droned on, protesters chanted at the police: “PROTECT US! PROTECT US!”. But they were instead met with canister after canister of tear gas. Those 87 burnt-out cans have now become the iconic evidence of hurt. On the other side of Victoria Harbour, Mong Kok was also being occupied. On Nathan Road, a girl with a loudspeaker said: “We are in Mong Kok, come and join us.” And come they did. For every tear gas deployed, 1,000 more flocked to the streets. Trucks drove onto Nathan Road to send in supplies such as food, water and towels. Trucks and cars “stalled” en masse at the main junctions of Argyle Street in Mong Kok to great applause. The familiar sound of the late rock star Wong Ka-kui, a much revered icon of of the 90s, wrote songs that epitomised the sentiment of that era. Anticipating the uncertain future of Hong Kong before the 1997 handover, there had been a wave – the first wave – of mass emigration. Now, in the midst of a second wave of mass emigration, those two songs have stirred deep emotions. A mass sing-along engulfed Causeway Bay. Tears flowed. Crowds hugged. The tear gas may have broken our hearts, but it has also united us against the iron fist of a tyranny that we now know we are all up against. 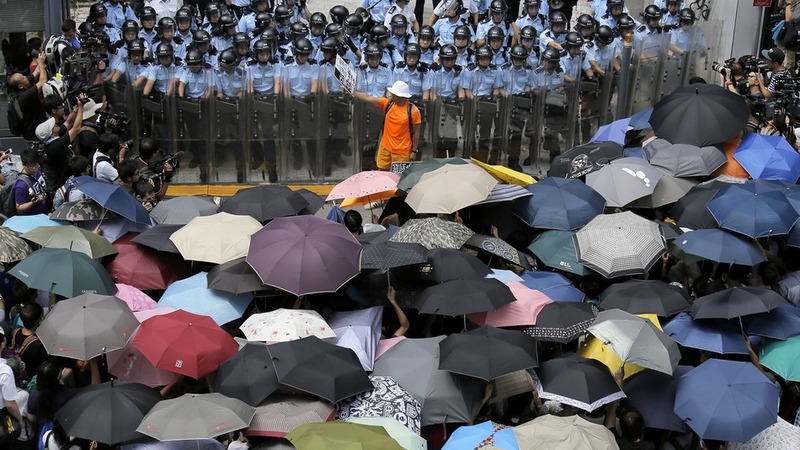 Let the Umbrella Revolution begin. * Kawai Wong is journalist and writer living in Hong Kong. She has previously written for the South China Morning Post, The Wall Street Journal, TimeOut Hong Kong and HK Magazine.